Many people are going gluten free these days because it has been discovered that gluten can be a very difficult substance for the body to handle. It causes inflammation which is the root of almost all chronic conditions including heart disease. However, I don’t want to demonize gluten itself. I don’t necessarily think that gluten was always bad. I think our society has developed a sensitivity to it because of gluten overload and because our wheat has been so hybridized to the point that our bodies can’t digest it very well anymore. Before this information about the dark side of gluten came out we were told to eat a huge portion of processed grains each day (remember the food pyramid? the entire base of the pyramid was grains!). Even though properly prepared grains (i.e. sprouted, soaked or soured) can be part of a healthy diet, for a long time people were getting their “daily recommended grains” by eating a large amount of over-processed wheat. Almost anything in mainstream grocery stores that is “whole grain” is wheat. Having one kind of over-processed grain that has been mostly stripped of its nutrients isn’t good for anyone. Removing this kind of food from your diet is good whether you are sensitive to gluten or not. 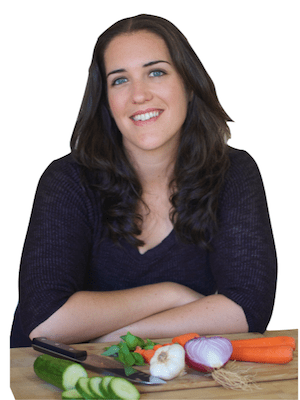 Of course there are people who have celiac disease who have a serious intolerance to gluten. Those who suffer from celiac have to be much more cautious about gluten. Any small trace can cause a reaction. The best way to avoid harmful gluten-containing additives and other harmful fillers and GMOs is to make your own food at home. That way you know whats in it! 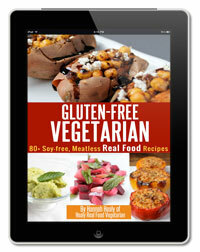 If you need more ideas for gluten-free, soy-free vegetarian meals, check out my ebook Gluten-Free Vegetarian! Below is a list of foods that many people do not realize contain gluten. If you are on a gluten-free diet, you may want to make sure to avoid these foods to continue to feel your best and avoid inflammation. 1. Tea- Some tea bags contain additives (usually labelled as “natural flavors”) that contain a small trace of gluten. The Tazo brand popularly sold at most starbucks locations has this additive and therefore is not gluten-free. The following flavors definitely contain gluten: Green Ginger, Tazo Honeybush, Lemon Ginger and Tea Lemonade. This probably won’t affect most people unless you have celiac disease and are vulnerable to small traces of gluten. 2. French Fries (diner style steak fries)- Of course, not all french fries have gluten. If you make your own at home there won’t be gluten, but if you get diner style steak fries at a restaurant, most of the time they put a little flour on the fries so they don’t stick together. If you do get fries at a restaurant make sure you ask if they add anything like flour to the fries. 3. 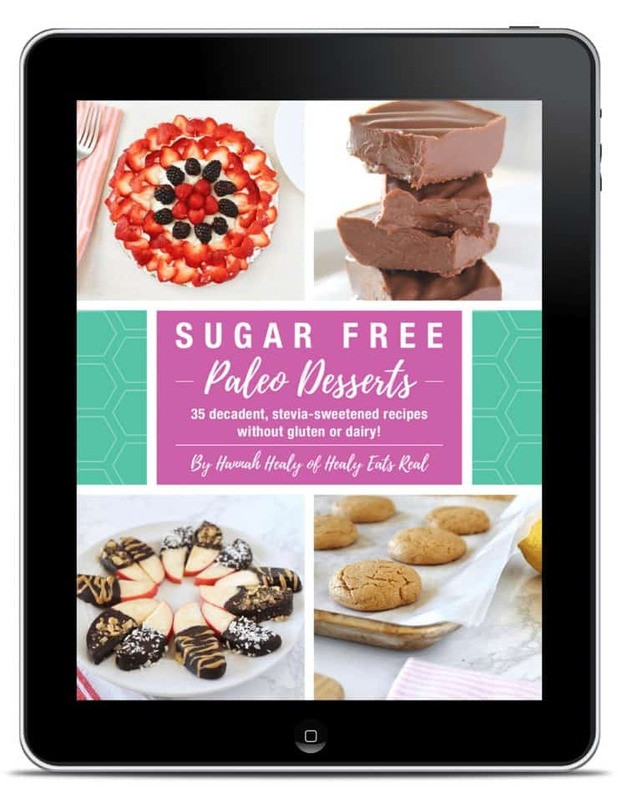 Ice Cream– Similar to the french fries, if you make your own ice cream or get a trusted brand with minimal ingredients there won’t be gluten in there. Many of the commercial brands, however, have additives like malt that contain gluten. I like making my own dairy-free ice cream at home. You’ll need an ice cream maker, but it’s totally worth it in my opinion for real gluten free ice cream! 4. Instant Coffee– Like ice cream, the additive ‘malt’ contains gluten. Make sure you brew your own organic coffee to avoid additives and if you choose decaf make sure it’s water processed so that it is gluten free and doesn’t have chemical residue from chemical decaffeination processing. 5. Soy Sauce– Soy sauce usually contains wheat so is not gluten free. Tamari is a great wheat-free alternative. I prefer coconut aminos because it’s gluten and soy-free. 6. Oatmeal– Although commonly thought of as a gluten free food, some oatmeals actually do contain gluten. However, many people who don’t have a serious allergy to gluten can handle oatmeal fine. Just make sure if you have celiac disease to get gluten-free oatmeal like this brand. 7. Beer– Beer is made with grains like barley that contain gluten. There are a few gluten free beer brands available if you want to remain GF and still enjoy a frosty brew! 8. Roasted Nuts– Some store-bought roasted nuts contain flours that have gluten. Make sure you check the ingredients. It’s always best to go with raw nuts like these. 9. Light Frappuccino– Speaking of starbucks, the popular light coffee flavored blended frappuccino also has a small trace of gluten from additives in the syrup. 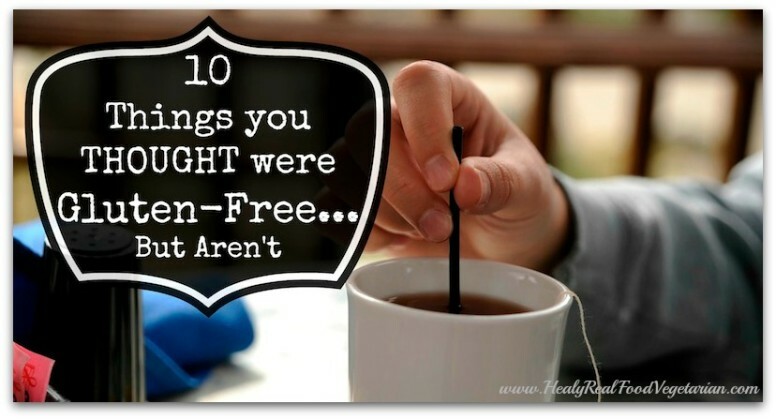 So, if you are very sensitive to gluten, you’ll want to avoid these drinks….actaully, you’ll want to avoid these anyway considering all of the artificial sweeteners, GMOs and processed sugar in them. Try making your own coffee drinks instead! Check out my recipe for a homemade vegan pumpkin spice latte, vegan peppermint mocha or healthy gingerbread latte. 10. Falafels– Falafels are a favorite vegetarian dish for many, including myself. Even though most people know that the main ingredient in falafels is chickpeas, what many don’t know is that there is added wheat flour in falafels to keep the shape and hold it together. If you want a gluten-free falafel recipe along with many other vegetarian meals check out my ebook Gluten-Free Vegetarian. Very Interesting! I can’t believe tea bags contain small amounts of gluten. That’s nuts! I usually stay away from all things flavored, naturally or otherwise. Totally shocked about tea bags!!! I never even thought to check them. Thank you, good list. I never thought about tea bags. Another is charcoal. I’ve heard it has gluten, licking stamps and envelopes and also watch out for artificial crab in things like California rolls. Interesting Verena, I never knew that about stamps! I learned stamps and envelopes the hard way..this past Christmas I licked all the envelopes, my tongue broke out in blisters and my symptoms came raging back. Next year it’s a damp sponge! It may be helpful for you to understand the history of gmo’s. While gluten overload may have it’s influence on sensitivity, genetically modified wheat is a relatively new practice. This is the dark side of gluten and the reason so many people have problems eating it now.